Name a fantasy of a foodie that couldn’t be satisfied in Las Vegas. From high rollers with big winnings to burn, to serious foodies seeking their next gastronomic thrill, the dining in Las Vegas attracts some of the most sophisticated palates in the world. Restaurants here are continually upping the ante with celebrity chefs and cutting-edge menus that cater to every taste and craving. The most vaunted Vegas chefs include names like Wolfgang Puck, Michael Mina, Mario Batali, and Emeril Lagasse, as well as French imports such as Pierre Gagnaire, Joël Robuchon, and Guy Savoy. Thus, you should expect the unexpected from the mind-blowing culinary scene of this dazzling city as your taste buds will face temptations they cannot yet imagine. Pack your appetite and let Las Vegas’ restaurants do the rest. 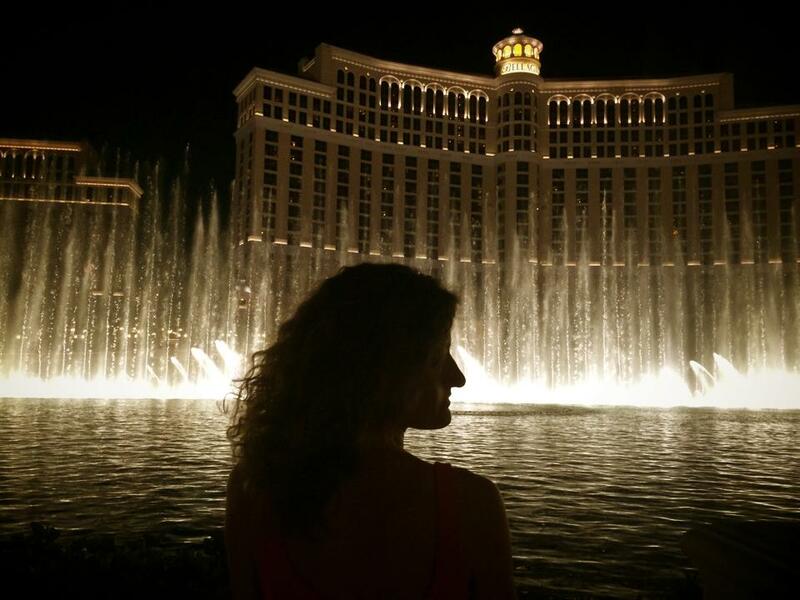 Needless to say, there are a plethora of Vegas restaurants that offer incredible experience and serve a special, once-in-a-lifetime meal. 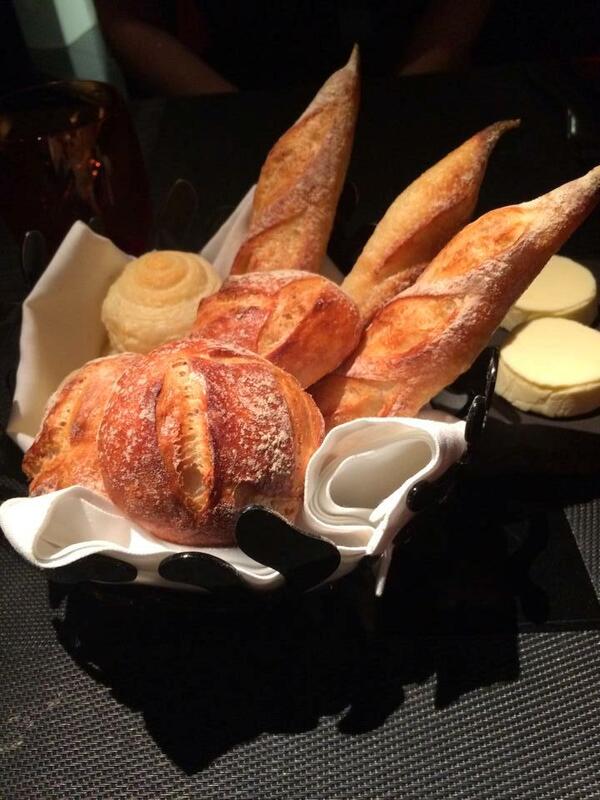 For our two nights of fine dining extravaganza Mr. B made reservations in the restaurants of two of the best Chefs in the world – Guy Savoy and Joël Robuchon. During those two nights we didn’t eat. We indulged. Crème de la crème of French haute cuisine, restaurant Guy Savoy went out and beyond to organize a truthfully decadent eating event for our special date night. 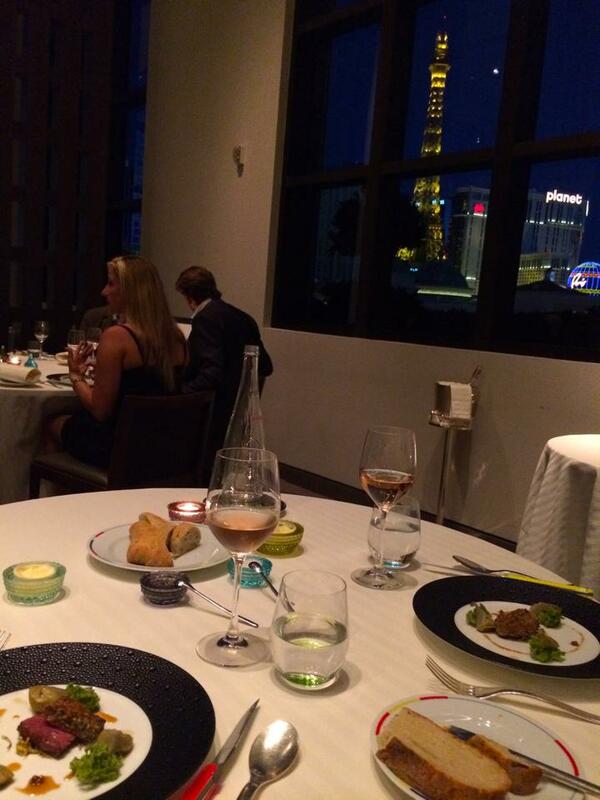 I loved our view of the Eiffel Tower which added another layer of romance to the night! 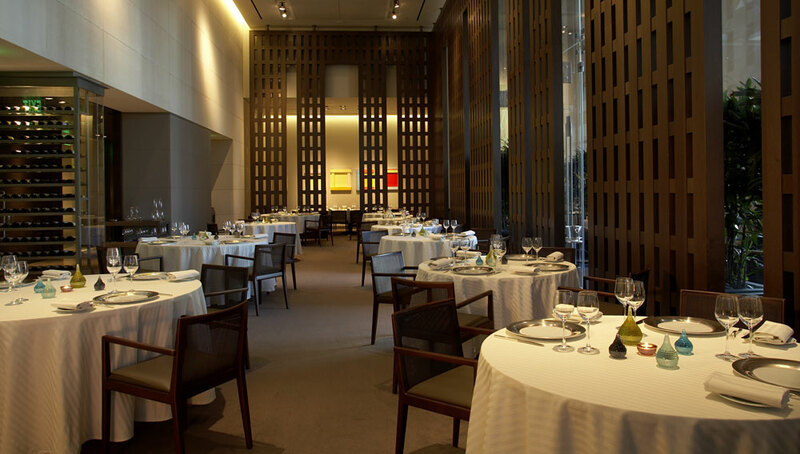 Every single detail in the restaurant spoke of luxury and opulence worthy of a two Michelin star restaurant: elegant ambiance, flawless, discreet service, and meticulously executed dishes. 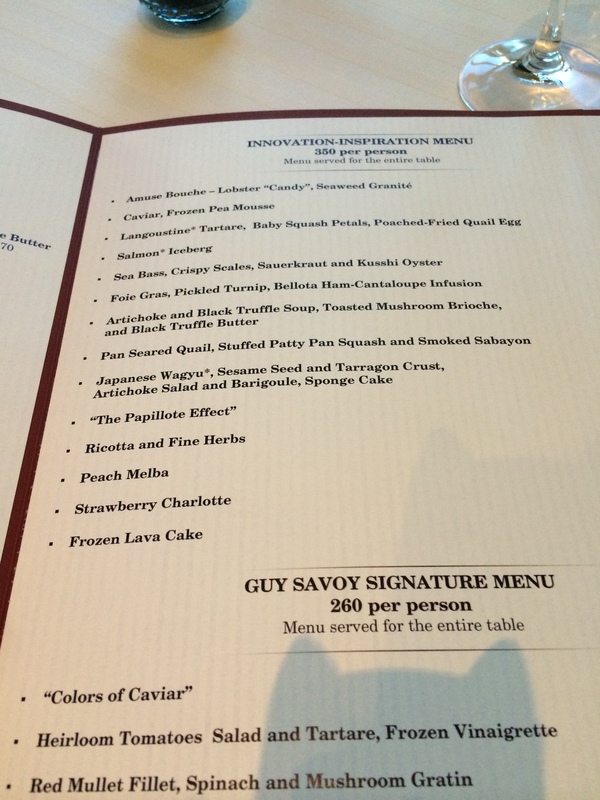 Interesting fact to point out is that the Chef Guy Savoy doesn’t include any flowers in the restaurant or allow any of his employees to wear perfume so as not to disrupt the aroma of his rich cuisine. The decor is minimalistic, yet sophisticated. Also, the French accent of our top-notch maître d’hôtel and impeccably trained wait-stuff sounded like music to our ears. These small attentions to detail create a more sumptuous, unforgettable experience rather than a quick meal. Guy Savoy is the youngest of the group of renowned chefs who invented “Nouvelle Cuisine”, taking a lighter and more delicate approach to classic French cooking. 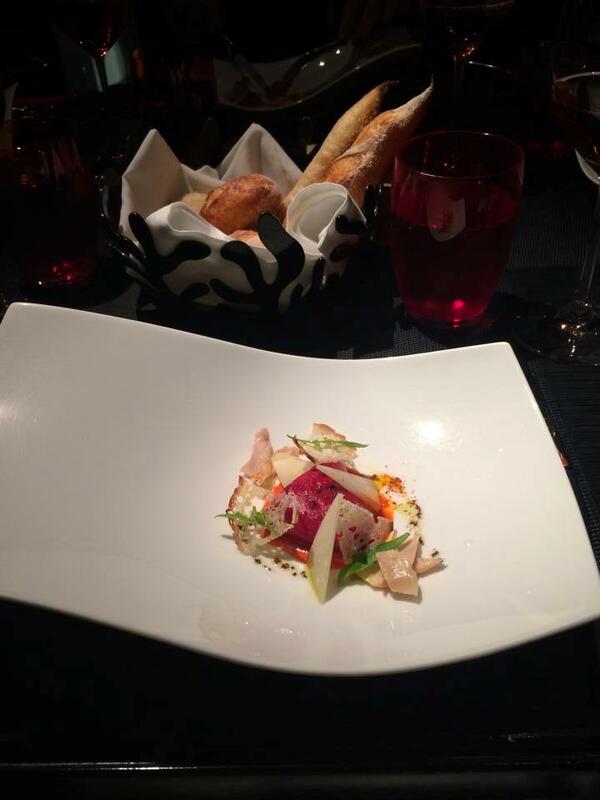 Our 14-course tasting menu consisted of elaborately prepared and presented plates which blew our minds. The rich, velvety traditional French cuisine can only be described as a “melt in your mouth” splurge. 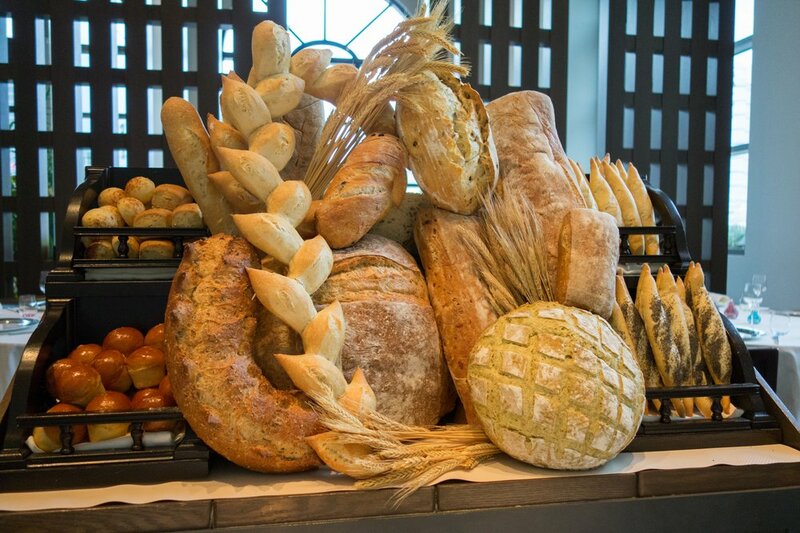 I cannot help pointing out the famous bread cart (which included seaweed, olive oil, sourdough, rye and of course baguettes) presentation which was a feast for the eyes. Throughout the meal they provide suggestions for additional bread pairings (yes, you heard me right, a bread pairing!) with each course, along with a large bowl of creamy French buerre. 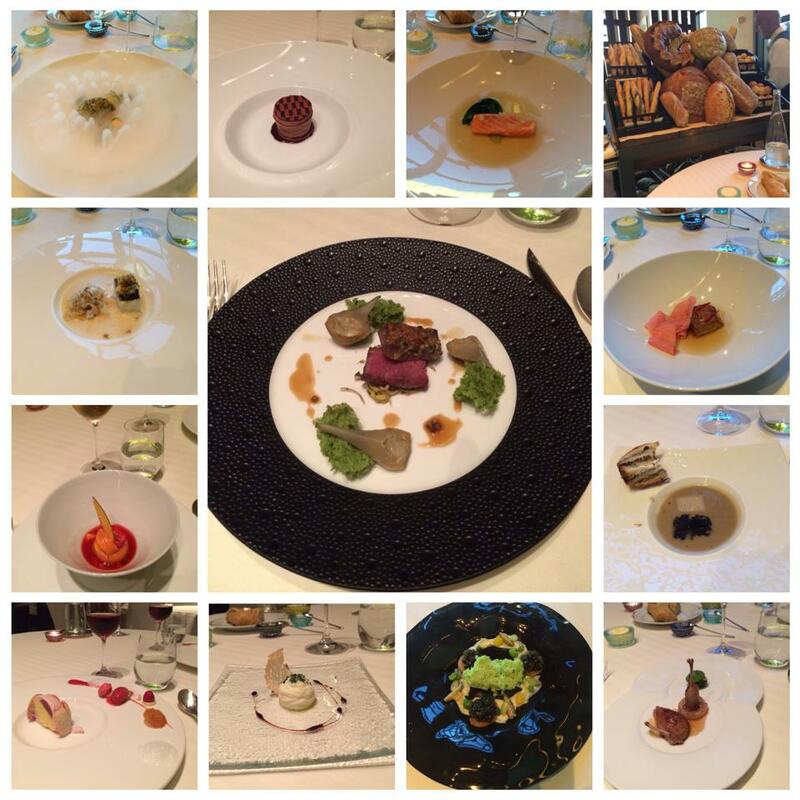 In fact, the presentation of every dish equals to a performance at Guy Savoy. 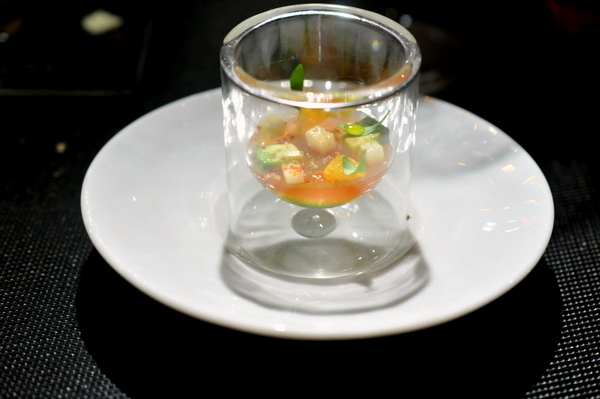 A continuously evolving menu utilizes more avant-garde techniques and I thought that Salmon Iceberg course exemplified that philosophy most clearly. 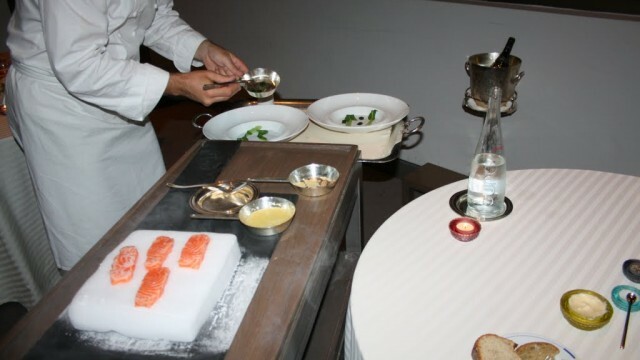 In the beginning of this course, the sous-chef rolled up a table next to ours with a steamy cube of dry ice on it as well as a couple of small copper pans and a wonderful cut of raw salmon. He soon explains that the course – salmon cooked three ways – will be prepared right in front of you. First we were shown a sliver of raw salmon so we could get an idea of its texture. Next it was cold seared on dry ice. The Chef pointed out that the dry ice was used to freeze the fat. Second, the frozen salmon was transferred to a hot plate and served with bok choy and chervil gelee and citrus. 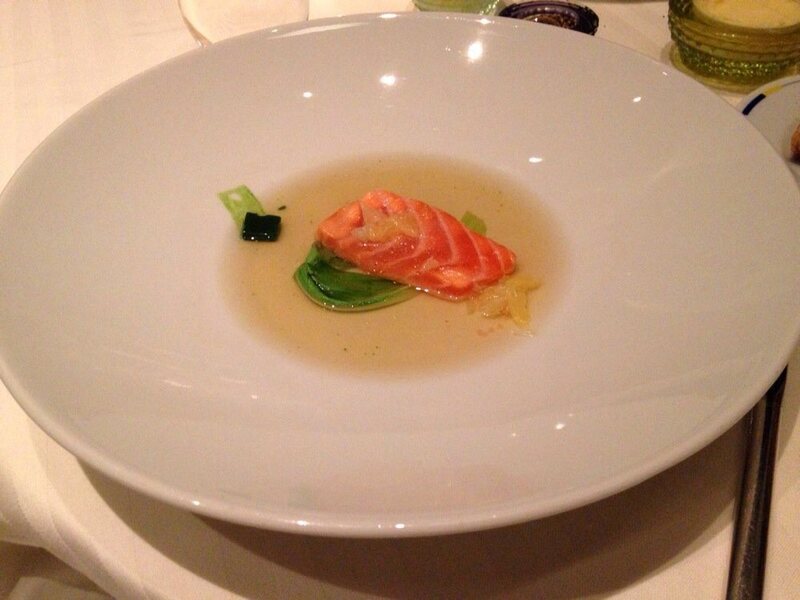 Finally, the delicate fish was topped off with very hot vegetable stock flavored with lemongrass to slightly cook the salmon. The broth created a wonderful texture and the chervil cubes made of jelly complimented the dish nicely. Another spectacular dish on our progressive tasting menu was a delicate lobster plated in cold steam. I believe the film below will demonstrate the splendor of this course more than any written word could. 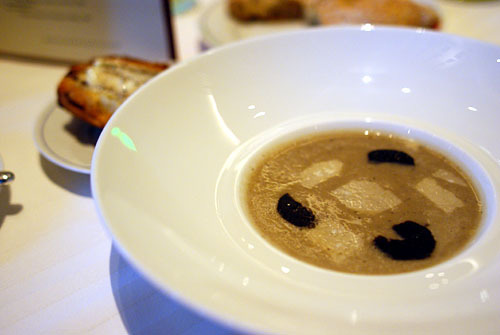 Chefs are very often remembered for their signature dishes and when people mention Guy Savoy they often highlight the Artichoke and Black Truffle Soup – artichoke puree shaved with black truffle and Parmigiano, served with mushroom brioche slathered with truffle butter. It has been a signature dish of the Chef since the 1980’s, and for a good reason. The intense broth perfumed with a distinct earthy flavor of aromatic black truffles gets better with each sip. The mushroom brioche was mind blowingly flaky and boldly flavored. As we were spreading the butter on the brioche the waiter proclaimed ”butter makes everything taste better!” And in this case it certainly did. We were encouraged to dip the pastry in the soup which created an incredible combination. In the end we were full beyond reason. But what an amazing night, the food is truly spectacular, the wine list extremely impressive and the service as good as it gets. It’s this perfectionist attitude that has made Joël Robuchon the success that he is today. 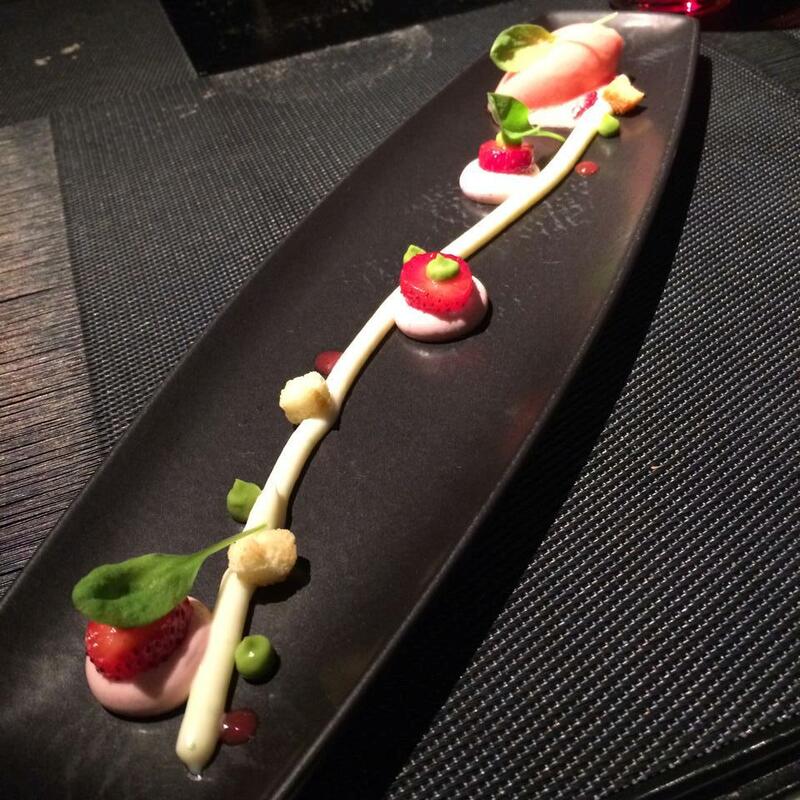 Joël Robuchon makes magic happen. There’s a reason why this guy has amassed more Michelin stars (26!) than any other chef in the world. He has won countless awards, winning top accolades in every ranking system you can imagine (Forbes Travel Guide 5 stars, S. Pellegrino Top 50 Restaurants, Gayot 19/20, just to name a few). Joël Rubuchon has two signature restaurants in Las Vegas. 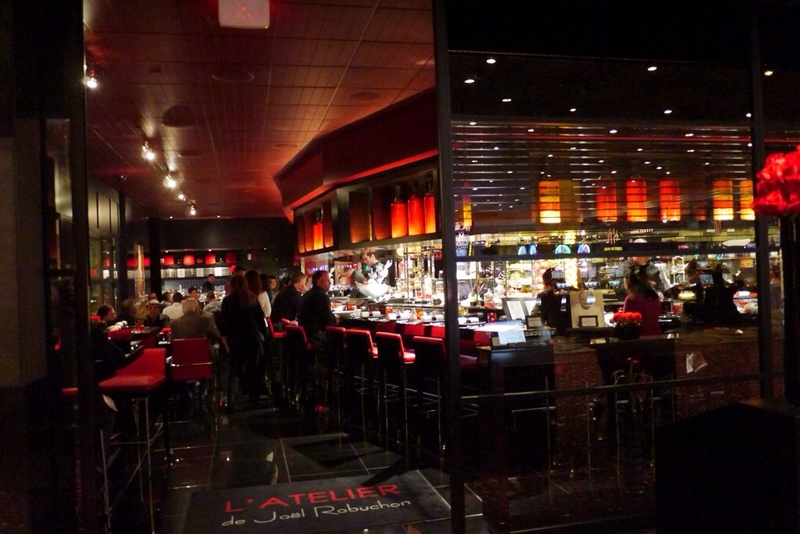 On this visit we opted for L’atelier de Joël Robuchon, a more casual version of his opulent mansion next door. With trendy bar overlooking an open kitchen, L’atelier is a unique and relaxed way to enjoy the cuisine of whom many consider to be the best chef in the world right now. The hot themes of red and black add to the modern vibe of the place. 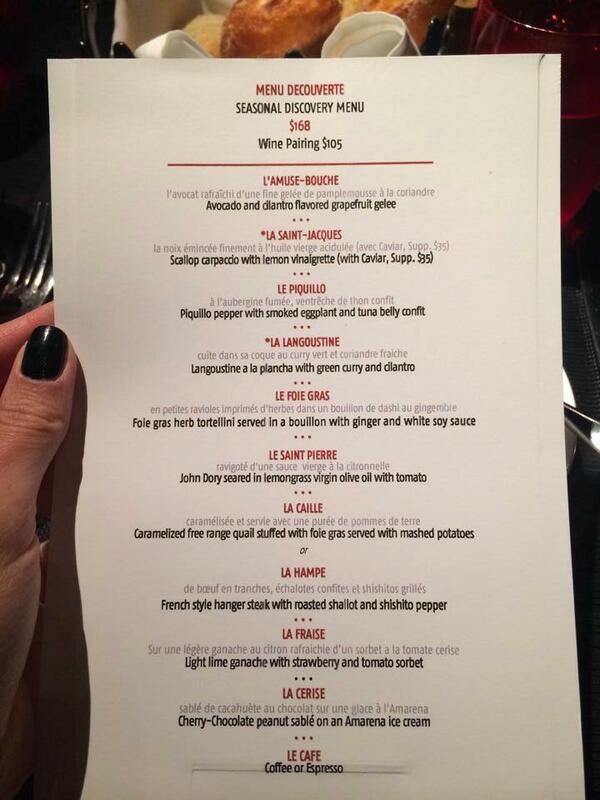 The 10-course Menu Decouverte turned out to be nothing short of incredible. A succession of elaborately presented dishes highlighted what perfectionist chefs can do with the best seasonal ingredients. With every plate you could see that the Chef takes great care in designing each dish, creating flavor combinations that will delight you, surprise you, and most certainly make you wish you had more. We started off with a serving of traditional house-baked bread and heavenly butter. The waiter pointed out that they serve Echire butter which was smooth, just a bit sweet, and had that really fresh, creamy taste. This butter is known to be among the best butters in France, made exclusively in a small town called Echire in the Western part of the country. Echire butter is mostly made in small batches by hand, and France only lets about 15% of it out of the country. After that we proceeded with our first course. L’AMUSE-BOUCHE, avocado and cilantro flavored grapefruit galee. Our amuse certainly did its job, tantalizing the palate with fresh acidity from the grapefruit with a creeping herbaceous bitterness. 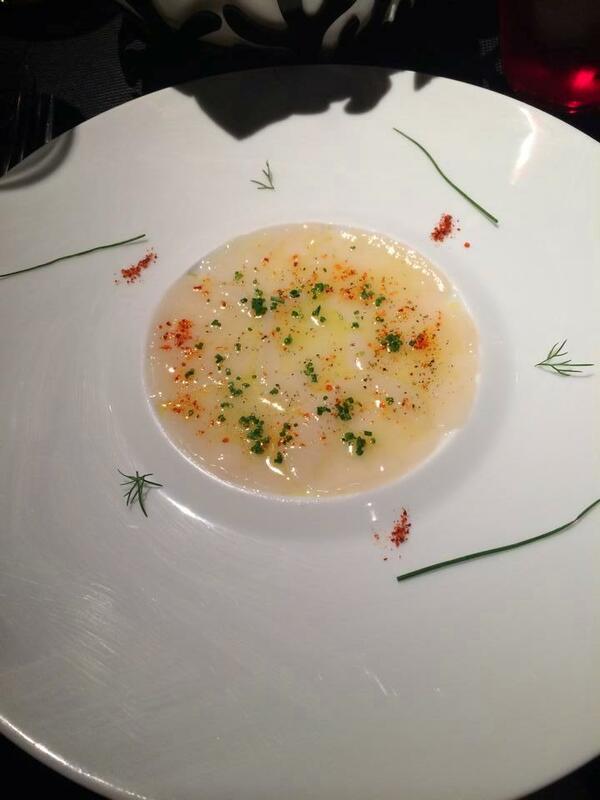 Next up was LA SAINT-JACQUES, scallop carpaccio with lemon vinaigrette. The subtle alabaster slivers were coated in a floral fruity mixture of lemon and olive oil and brightened with a hint of spice and zesty chives. Third course was LE PIQUILLO, piquillo pepper with smoked eggplant and tuna belly confit. A riff on a popular Basque region tapas, this dish drew its inspiration from Spain rather than France. The characteristic smoky vegetal twang of the pepper takes center stage and I enjoyed the oily smack of gloriously crimson tuna. My absolute favorite course of all times and the starlight of this menu was LE FOIE GRAS, foie gras herb tortellini served in a bouillon with ginger and white soy sauce. I can still remember the explosion of flavor of the silky smooth foie gras as I bit into the perfectly cooked tortellini. 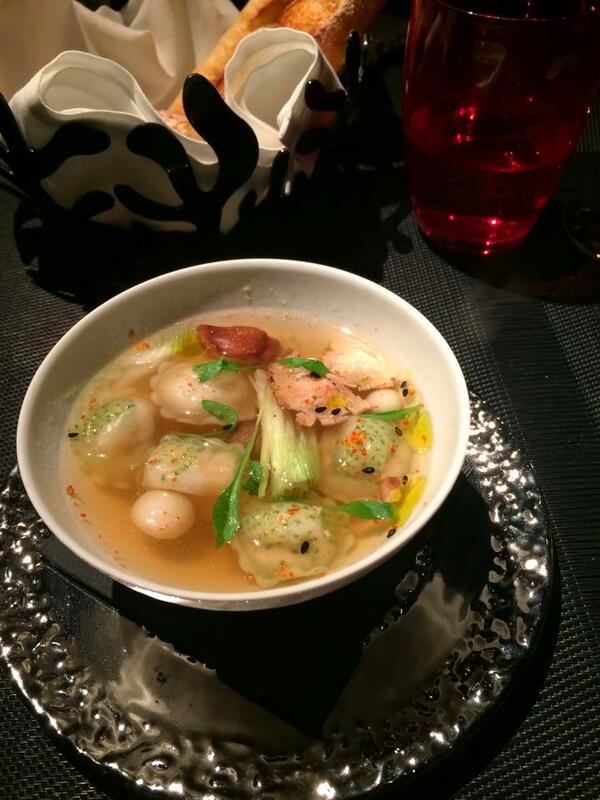 Smooth taste of the delicate and light dashi broth further elevated the richness of the dish. I could eat this ever.single.day. 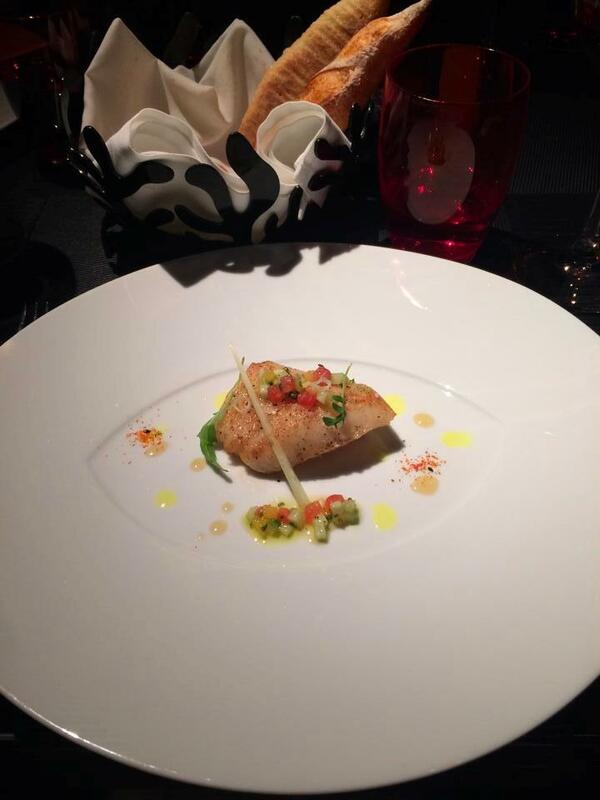 LE SAINT PIERRE – dense fish filet of John Dory seared in lemongrass virgin olive oil with tomato. Browned in a lemongrass olive oil, the Dory had plenty of complexity and depth of flavor. The finely diced tomatoes added a fresh succulence and salsa-like zest. 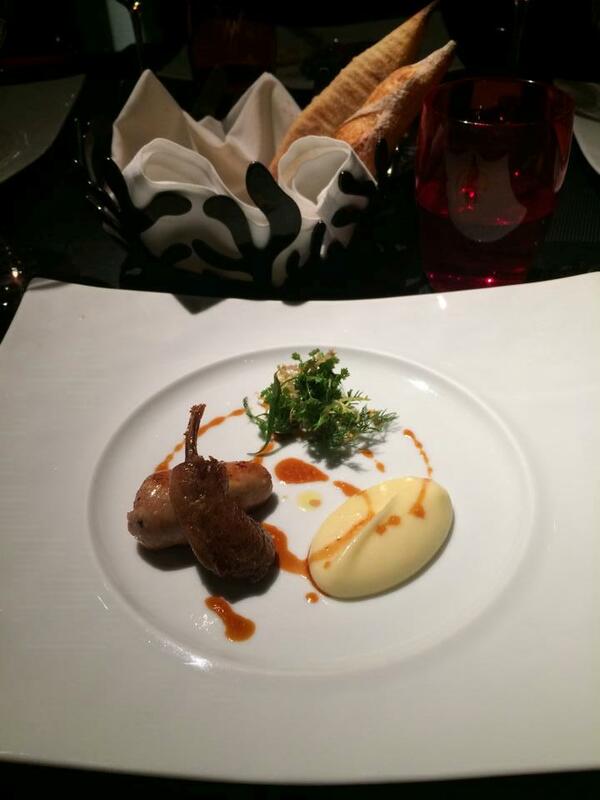 LA CAILLE was the final main course, foie gras stuffed free range quail with mashed potatoes. Let me start with highlighting the side of mashed potatoes. If you didn’t know before, Joël Robuchon’s mashed potatoes are insanly famous, we’re talking really really famous. It was creamy and perfectly smooth. Although the potatoes have tons of butter in them, the end product tastes fresh and flavorful, not heavy at all. The sweet and savory glazed quail was perfectly cooked and had a nice supple texture. And do I even need to comment on the creamy foie gras stuffing? I was in heaven! At this point we were already incredibly full. 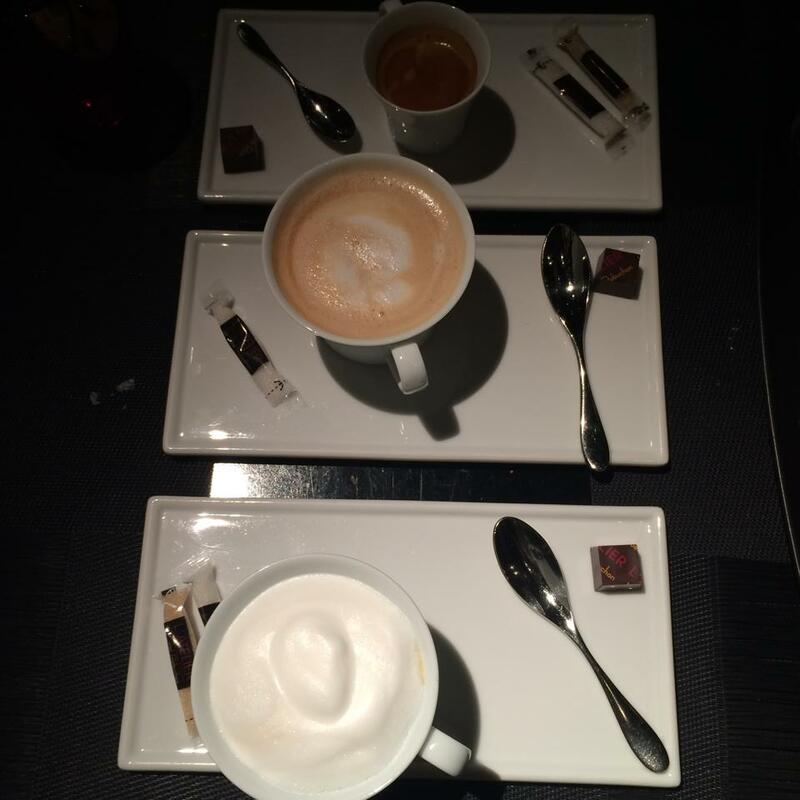 However, two desert courses were still to be served. Our first dessert, LA FRAISE, combined ripe strawberries and tart lemon with the savory vegetal note of tomato. The dessert was further embellished with bits of toasty crunch and subdued herbs; a mixture reminiscent of a fruity Bloody Mary. 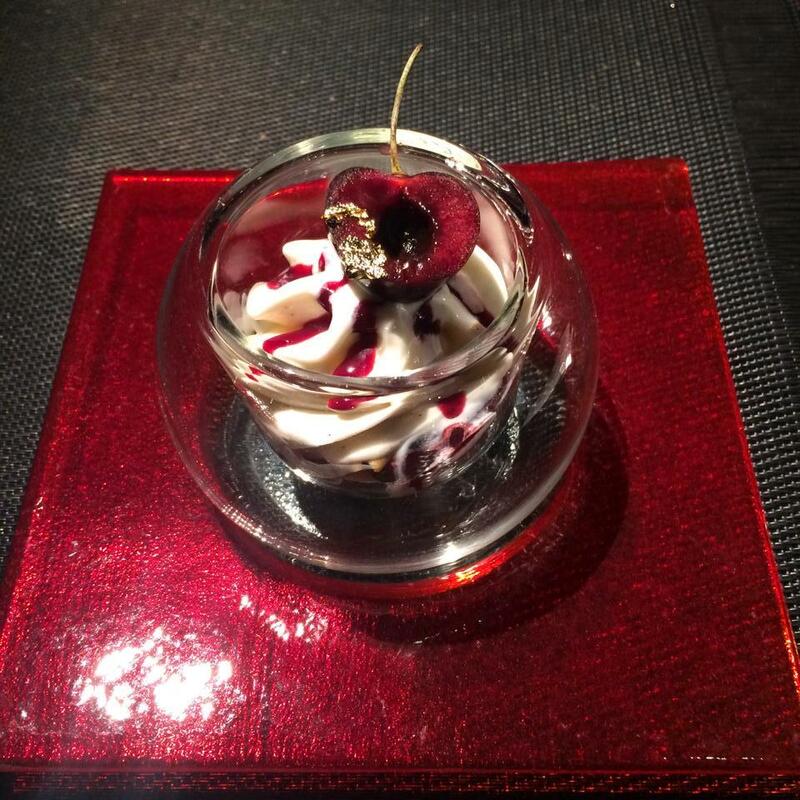 Last but not least, we were presented with LA CERISE – cherry chocolate peanut sablé on an Amarena ice-cream. How gorgeous is this dessert? This final course on the Menu Decouverte drew on a classic mixture of cherry and chocolate. The ripe cherry was immediately apparent in the form of a succulent fruit tinged with medicinal bitterness. The sablé exploded with nutty relish and provided a crumbly texture to balance the cherry ice cream. We ended the evening with a cup of coffee which came in incredibly handy as we still had to explore the nightlife of the Strip. 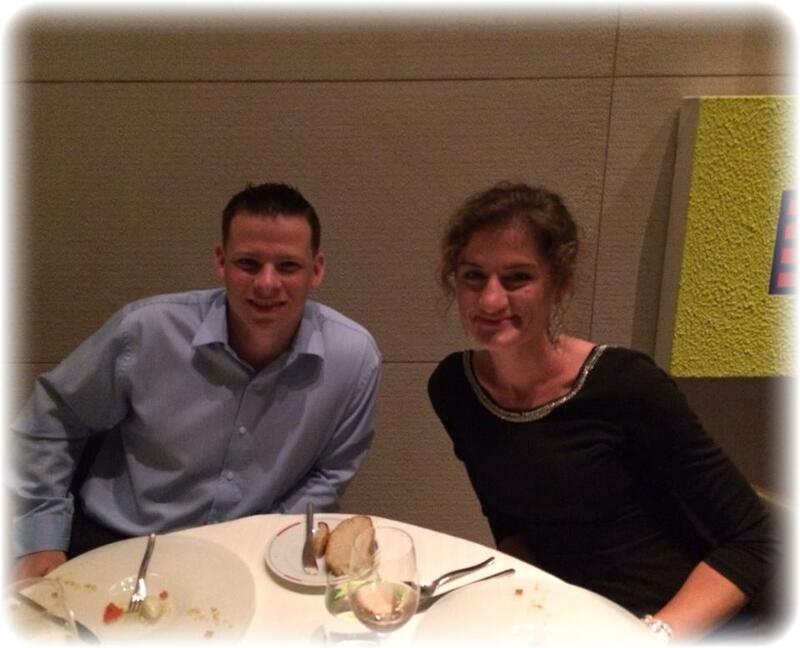 Overall, we thought several of the dishes were incredible, and all of the dishes were excellent. 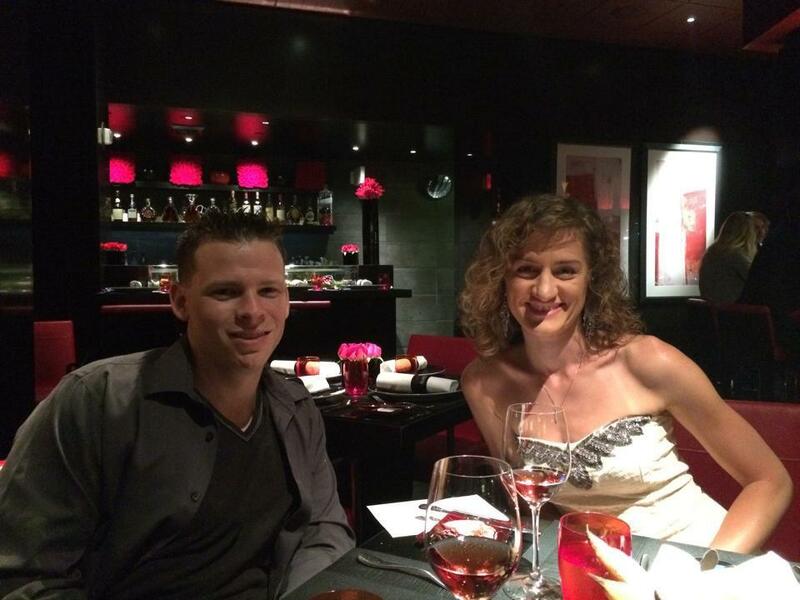 The service was great, and the ambiance was modern, trendy, yet relaxed at the same time. Many of our friends consider us insane when they hear about our extravagant culinary adventures which often times are accompanied by the exorbitant bills. However J and I strongly believe that sometimes eating and dining out should not just be a method of nourishment, but an experience to enjoy, remember, and share with fellow foodies.